This fruity cake is going to delight your loved ones with its silky texture and an irresistible flavor that'll liven up your taste buds. It can be made in a few simple steps with limited numbers of ingredients. Use ripe bananas and fresh blueberries to get the best possible results. You cannot keep this cake preparation for a long time, so make sure you make it in a limited quantity. Blueberries quantity can be moderated on a small scale. This cake is quite nutritious and is a good option for a portion of the breakfast serving. In case, you want to try a different type of berry or a different fruit altogether, you can experiment with that too. So, let's get our oven ready to prepare this simple and fruity cake recipe. 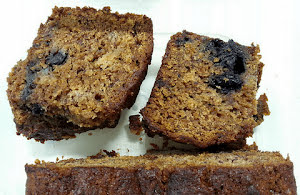 Do try this lip-smacking banana and blueberry cake recipe which is baked to perfection with limited ingredients giving you a unique flavor and texture. Preheat oven at 175° C and grease a 10 or 12 inch cake baking tin. Sift flour and baking powder. Keep aside. Beat eggs, melted butter and brown sugar in a blender till you get a smooth texture. Add mashed bananas, lukewarm milk and vanilla extract. Pulse for about 1 minute. Combine this mix with the sifted flour and blend for about 2 to 3 minutes. Add semi-dried crushed blueberries and gently mix with a spatula for a minute. Pour the cake batter in a greased cake tin and let it settle for a minute. Bake for about 50 to 55 minutes. Cool down to the room temperature and cut the cake slices in your desired shape.